Hi, there I'm Jeannie Casey and I love teaching and have been teaching The Bradley Method for 28 years. 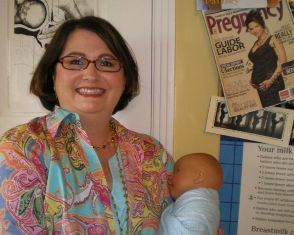 I am a Birth Doula, Postpartum Doula, Baby Care expert. I am a advanced skills Doula trainer, Lactation Consultant. I love sharing about the birth ball and peanut ball usage for labor, baby calming techniques, baby and toddler signing, exercises in pregnancy to optimal baby positions and baby wearing, placenta encapsulations. I have taught this class 250+ times and have 1000's of happy successful students having natural births after taking my class. and hearing what YOUR ideal birth is. The Secrets to having the Birth YOU can Brag about. Bradley Method Natural Childbirth classes / Husband Coached Childbirth, 12 weeks of techniques that will teach you as a couple the secrets to getting your baby born with the most comfort and speed. I replace your husband’s fear with powerful confidence and skills to use with some special techniques so he is in charge and can be proud to lead and support you in your labor with this new knowledge. A man’s fear is about screwing up, and disappointing you or letting the birth deviate from his wife’s plan. A woman knows she wants a natural birth but fears about not getting the right childbirth education, not using the right positions to use, etc. Having her husband ready and trained to be hands-on and know what positions to use, and techniques to make labor easier. I teach you all of what you need, and things that you don’t even know you needed. You need to feel safe and comfortable to learn this material and ask: “this might be a dumb question”. For this reason class is limited to 7 couples only. You’ll sit on pillows, in comfortable clothing so you can be focused, relaxed and happy. We also use your love nest seating area during relaxation when I teach you some life changing techniques to melt away those pregnancy pains. I also teach you how to tune in to your body, relax with labor, work with your body, breathe, push to save you from tearing, calm a crying baby, breastfeed etc. Plus you’ll benefit from my experience as a doula I have seen what happens during a hospital birth and know how one can work around difficulties that might arise in that setting. This is not the short 4-6 hrs childbirth class you get at the hospital or with another teacher's Crash Course, Run away from those uninspired classes. This class is for those who really really want a natural birth, and aren't kidding around about wimpy classes, a doctor, midwife or friend told you to take. Yes, I SAID IT, "Find your own class", it’s your birth not theirs. Turn in to your intuition to select a class and teacher. I prepare you and your partner to have the tools and knowledge to actually do this birth the way you want. No regrets the first time. We meet In a comfortable Brentwood/Cool Spring area home. We have our own private classroom, and class Includes Social Time/juice & snack break for couples, (yes, dads huddle together for some dad talk and new friend making). You have wonderful natural childbirth videos, including films on birth and breastfeeding, and learning massage and relaxation techniques each week. Yes, ladies, you will love the massage!!! Men love being educated so they are "IN CHARGE" AND READY for your great birth. Smoking will not be tolerated and those who smoke will be asked to leave the class. Those with 2nd hand smoke on their clothes or skin or 3rd hand smoke will also be asked to leave. This includes chewing tobacco and Electronic Cigarette/e-cigarettes products. If you try to come to class and you and/or partner are discovered breaking these rules you will lose your complete class fee and be asked to leave. In this environment we are in close personal contact with each other. It is my responsibility to each fetus, mother and father to provide a clean environment.